Increasingly, I am convinced that I am suffering from a learning disability that keeps me from knowing what is actually going on in the world around me. This time, I somehow missed that there is a giant vortex of garbage (primarily plastic debris), bigger than the United States, swirling around in the Pacific. Actually, it is two huge, linked garbage patches comprised of some 3.5 million tons of debris! 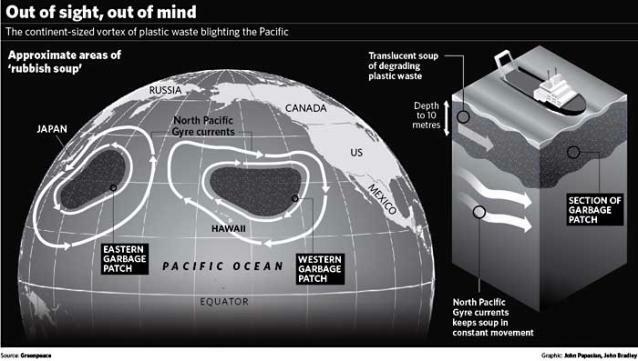 Occupying the North Pacific Gyre, it kills some 1million seabirds annually and some 100,000 sea mammals, according to the United Nations Environment Programme. 46,000 pieces of floating plastic per square mile. a menacing medusa of tangled net lines and hawsers that we hung from the A-frame of our catamaran and named Polly P, for the polypropylene lines that made up its bulk. And, given that plankton is one of the biggest building blocks of life on Earth, serving as the basis of our global food chain, I particularly like the notion that there is more plastic in the Pacific Ocean than plankton. It is to the point that there is http://www.greatgarbagepatch.org/. You don’t even want to think about how this is getting back into your own foodchain. And, I thought that all I had to solve for my children and their children was Global Warming! I wonder which Agency has covered this in their briefing books for President Obama? Somehow, I suspect that a swirl of plastic garbage 30 meters deep and 1500 miles wide has escaped everyone in Washington, D.C.